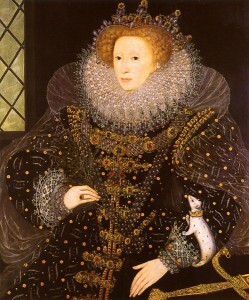 It was in 1563 that Queen Elizabeth founded and endowed her “Grammar School” in Guernsey. It was not the first scholastic establishment in the island, for schools were already in existence in St. Peter Port, St. Pierre du Bois and in St. Martin’s. However, these, were parish schools and, perhaps naturally, their standard of education was not particularly high. At that time Guernsey, along with England, was in a state of religious confusion, due largely to the introduction of the Protestant system, though the island was still in the diocese of Coutances until, in 1568, it was transferred to Winchester. Its not clear why the Queen wanted to found the school but it may have been as a way of ensuring that the education of future generations was firmly founded in the ‘new’ Protestant theology. and five years later, the grant of a further ten vergees which had also belonged to these friars. So in 1568, the Governor handed over the entire property to the States of Guernsey, who have been the landlords ever since, but while they own the fabric they do not run the College as a States school. So throughout its life, and continuing on up to today, Elizabeth College has kept its individuality. In its infancy the College was a great deal more extensive than it is today, not in the main building which must have been insignificant, but in its total acreage. Four hundred years ago it was bounded by the Grange, Upland Rd., Rue des Freres and College St., whereas today its area is much less. So What remains of the original College buildings today? Very little. Some mouldering ruins in the land which may have been part of the Friary, the spring of an arch adjoining the former Palace Theatre, the school pump (now public property) at the foot of College St., and some antique arms which now surmount the Upland Rd. entrance. At the outset no scholar paid for his tuition, but he gave a New Year gift of a guinea to the Master, (who at the foundation was not obliged to be in holy orders), a shilling to the servant, and half a crown for coals. The original statutes of the College provided that certain subjects should be taught, mainly Latin, Greek, French and classical history; letter writing and some time could be allowed for such frivolities as singing and arithmetic. Elizabeth College began its career auspiciously by engaging one of the foremost scholars of the day as its master, the Flemish refugee Dr. Adrian Saravia. He was a brilliant man, one of the translators of the Bible, but he found life in the remote island difficult, the people totally uninterested in education, and after 5 years he left. His portrait appears in the stained glass window which adorns the College hall. His work there and that of many of his successors was disappointing because the people of Guernsey would have none of their College. It lacked pupils and its masters’ position was a sinecure; indeed from time to time there was no master there at all, and as for the establishment paying for itself, it never did. The College fabric was kept in repair by the States, although in the passing of time more and more of its original property passed into alien hands. In 1635 King Charles I founded three Fellowships at Oxford (at Exeter, Jesus and Pembroke Colleges) and some 40 years later another 5 scholarships were founded, for natives of Guernsey and Jersey, although Jersey did not possess a public school of her own until 1852, for though Queen Elizabeth gave a licence to a new college in Jersey its funds were misappropriated. During the Civil War, when Castle Cornet supported the King’s cause and the rest of Guernsey sided with his enemies, the Royal Court was obliged to vacate its seat at La Plaiderie and sit at Elizabeth College, which was out of range of the Castle’s guns. We may be sure that this strategic move did not inconvenience the scholars for there were probably none at the time! Until the 19th century the number of boys at the College at any one time was pitifully small. 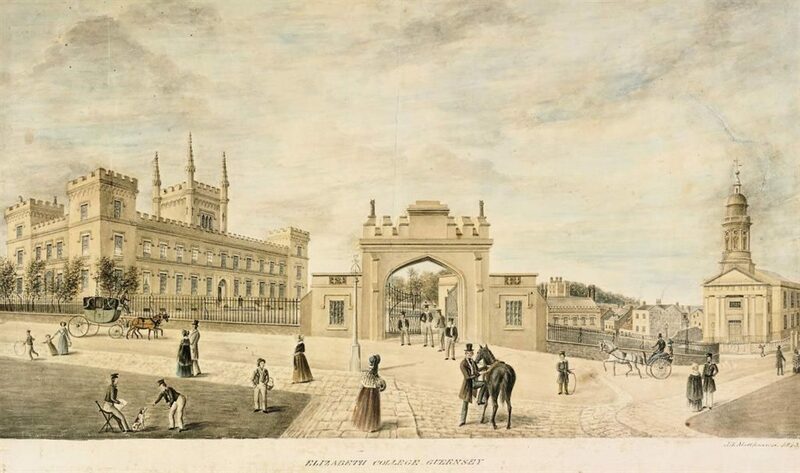 It was not until 1821, when there were only 16 boys at the College, that Guernsey became fully aware of the priceless heritage which she was permitting to decay, and it was substantially due to a Jerseyman, George Le Boutillier (the man who also planned the Commercial Arcades in St. Peter Port) and an Englishman, Sir John Colborne, the Lieut. Governor, that the island stirred itself into action. An enquiry was set in motion, with some difficulty, as no records seem to have been kept, but finally a new Charter was obtained and the foundation stone of the present imposing building (by John Wilson who also built St. James the Less earlier) was laid in 1826 by Sir John Colborne. When it was reopened in 1829 only English masters were engaged, so as to gradually eliminate the Guernsey accent in speech! Another stipulation was that an applicant for a Guernsey rectorial living should have preference if he had been educated at Elizabeth College and was a native of the island. On June 20th, 1940, 156 boys of the College, with the Headmaster, the Rev. W. H. G. Milnes, and the other masters and their wives, were embarked on a Dutch ship and taken to England and after many difficulties found a wartime refuge in Derbyshire where they carried on until they were able to return after the Liberation to the College buildings. During the occupation the College buildings had been occupied by the Germans and the rehabilitation was a colossal task. The College in 21st Century Guernsey is still a vibrant centre for island education and is set to continue educating future generations of Guernsey boys.